I guess my run had to end sometime. After seven straight days of seeing movies, I didn’t expect that the sun would rise and set without me having seen one. But happen it did. I got my tuxedo on again for a gala premiere, this time for “On the Road.” I wasn’t particularly excited for the movie or the stars, but I figured I might as well go because I didn’t have any particularly big plans for the evening. The screening was to begin at 7:00 P.M., so I got into the line beginning around 4:15 P.M. There was that long, unglamorous stretch of time where nothing happened again. Then around 6:00 P.M., things did start to pick up again with the red carpet arrivals. They start to play some halfway decent music and you crane your neck to see if that random woman is Berenice Bejo or just some random woman. 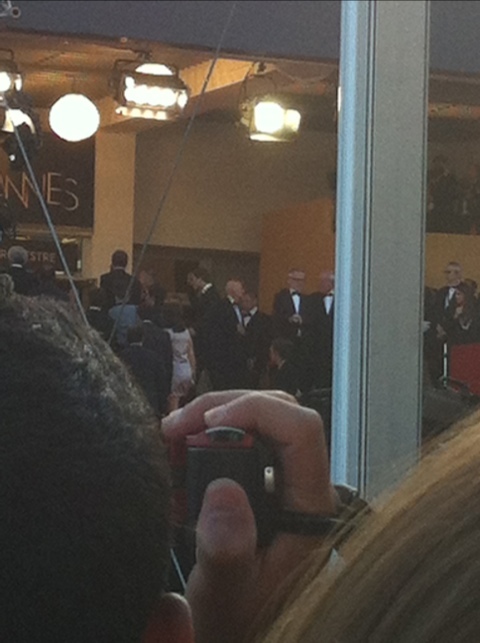 Around 6:30, I heard a high-pitched squeal and quickly looked to my right to see Robert Pattinson himself. He looked unshaven and carefree in his Dr. Strangelove-esque sunglasses. I did manage to snap a picture of him from afar, but it’s going to be a Where’s Waldo puzzle for you all. And then the whole cast showed up; the main three actors rolled up in vintage wheels. Kristen Stewart looked like she had spent a grand total of two minutes on getting ready. Kirsten Dunst, on the other hand, looked like a million bucks. And unfortunately, Amy Adams was a no-show. 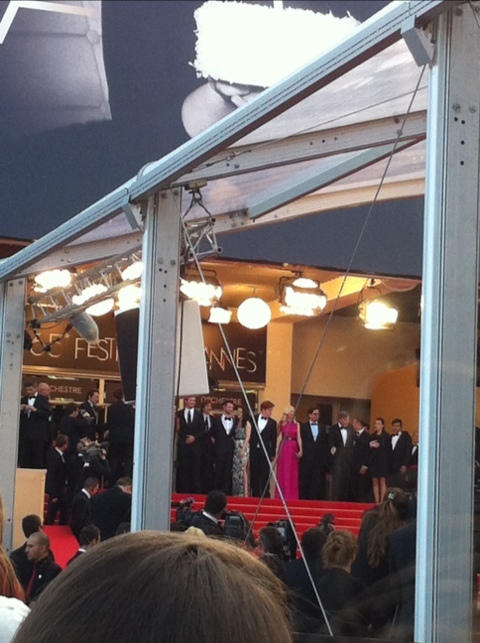 I got this picture of the cast lined up on the steps; Stewart is in the black and white dress and Dunst is in pink. And while the rush line had worked for me the day before, I was not so fortunate this time. They did not admit a soul from the rush line and even had to turn away people with tickets! I walked away disappointed, tired, and with aching feet. Sorry for the delay, Internet woes abound in France. Monday was another uneventful rainy day – bad for you to read, but good for me to write. I left my apartment for Cannes today at 12:15 P.M., which felt SO NICE. I got about nine or ten hours of sleep last night, and it turns out that was just what the doctor ordered. I hit my wall on Sunday, so I was glad to be really alive and experiencing Cannes again. However, Mother Nature did not reward me with a bright, sunny day with my new found eagerness. Instead, it drizzled sporadically and the sky was gray. That is, on the other hand, the perfect environment to watch a movie and not feel guilty about sitting indoors for two hours. And today, I watched my first movie of the festival in which I did not fall asleep or drift off even for a moment. That could be due to the fact that the film, Thomas Vinterberg’s “The Hunt,” was truly remarkable and easily the best moie have seen over the course of Cannes. It doesn’t have US distribution yet, but it really should. This movie needs to be seen. Struggling to find something else to write about this day …. um, let’s see, I had a banana and Nutella panini? I bought a donut from a kiosk? I saw no celebrities? Hopefully there will be something more than a beautiful landscape in my next post. Every year, the studios with any self-respect release a film or so between August or October meant to fill a very small hole in the market: respectable films that aren’t quite Oscar contenders but have more brains than your average popcorn flick. Occasionally, one of these will break away and compete in awards season (“Moneyball,” to name one from last year), but more often than not, they just gain respect and claims at the bottom of a few year-end underrated lists (“Contagion,” to take another 2011 example). There’s nothing wrong with this middle except for just like in politics, where it is more popular to go to extremes than be a moderate, such products are hard to bundle and sell if an audience does not know exactly what it will be getting. “Lawless,” John Hillcoat’s drama set in Prohibition-era Virginia countryside, fills such a groove. It does not quite have the overall package to compete for Oscar gold, but it’s hardly a bad movie by any stretch of the imagination. It has flaws, particularly in the insipid first act weighted down by exposition; however, when the film kicks into high gear, it provides a riveting ride. While I haven’t been a big fan of Shia LaBeouf since “Even Stevens,” which I can now continue to argue is his most accomplished work to date, “Lawless” gets bolstered by a number of supporting performances that should garner the actors some much overdue recognition. Surprisingly, one of these tour de forces is not given by Jessica Chastain, cinema’s new “it girl.” She’s fine, don’t get me wrong, but Chastain and Mia Wasikowska seem only relevant to the film for marketing purposes, token females to help reach another quadrant. Well, folks, the burnout has finally arrived. This morning, after a brisk sprint to make it to a screening on time, I settled into my seat in the Lumiere and promptly fell asleep for 20 minutes. I almost contemplated just going back to my hotel room and sleeping for the most of the afternoon, but then I remembered the existence of Diet Coke. I got up early for a screening of Michael Haneke’s “Amour” at 8:30 A.M. However, even though I was ready on time, my bus passed me by because it was already full … yanking my comfortable cushion and leaving me wondering whether or not I would even get to see this movie at all. The next bus came in ten minutes or so, and when it arrived at the stop, I ran off and sprinted to the Lumiere. Surprisingly, even that early in the morning, it was one of the most attentive I had been in a screening … and it was subtitled too! After that, I had a little bit of down time to write before attending three all-star panels at the American Pavilion. The first was with independent film directors Rodney Ascher of “Room 237” (a documentary on “The Shining” that I’m planning to see tomorrow evening), Adam Leon of “Gimme the Loot,” and Ben Wheatley of “Sightseers.” The blogger in me enjoyed it, although the conversation was pretty much directed towards aspiring filmmakers, something which I am not. Then, there was a panel about film marketing and advertising, a field that really fascinates me, and the conversation largely centered around the art of the trailer and satisfying your core audience even if you believe you can hit one of the other “four quadrants” (male, female, old, young). The panel included Doug Wick, the producer of “Gladiator” as well as Cannes competition film “Lawless;” I got to shake his hand and congratulate him on the movie’s success. (That is, I’m assuming it will play well with audiences – snooty critics looking to crown the Palme D’Or will surely not like it much.) Oh, and David Poland of Movie City News was also there to provide a different perspective. I gladly thanked him for what he does for long-form journalism. If you are a real movie fan, then you NEED to be watching his DP/30 interviews on YouTube. Other than those four events, it was a gross, disgusting rainy day in Cannes. Definitely didn’t come here for this weather. Yet somehow, in spite of the grossness of the icky day, Cannes still looked remarkably beautiful. Houston makes me depressed in the rain (except now, when I rejoice for rain in our drought-riddled state). But Cannes, on the other hand … just wow. It made me think of a certain scene in the rain, and then I remembered that sometimes magic can happen no matter what the weather. Getting down to the core of our humanity (or the bone, if you will) is a difficult and unsavory task, but you may hardly notice just how rough it can be until Jacques Audiard has released you from his grasp when the credits of “Rust and Bone” roll. His cinematic paean to the resilience of the human spirit takes two characters down to their most starkly naked vulnerability, putting them through an emotional and physical gauntlet that tries them as well as the audience. The end of the tunnel may not be brightly lit or accompanied by tremendous fanfare, but it reinvigorates and revitalizes in a way that only a truly great movie can. With two phenomenal actors, Matthias Schoenaerts, on the way up after last year’s Oscar-nominated “Bullhead,” and Marion Cotillard, who continues to prove movie after movie that “La Vie En Rose” was no fluke, “Rust and Bone” aims for painful areas of the psyche. Failure, loss, disappointment, desperation, and adversity are all sores opened by the movie, and it continues to stick a finger in them when it would be far less painful to just think about them being there. Yet it is precisely this wrenching of the soul that gives the film power and emphasis. In a cinematic climate where misfortune has evolved from beyond a niche and is moving towards an entire genre in and of itself, it takes a lot for a movie to distinguish itself from the pack. And believe me, from now on when I think of films about the mettle it takes to overcome immense tribulations, “Rust and Bone” will shoot to the front of my mind. And that’s not just because Marion Cotillard is proudly sporting two limbs instead of four for the majority of the film. Audiard, who also co-wrote the film, finds a natural way to intertwine two disparate tales of suffering into a satisfying and believable romance without hokey stunts or sensationalism. Her Stephanie is a former whale trainer at the French equivalent of SeaWorld turned Cannes penthouse-dweller after a tragic accident in the water. His Alain is a well-meaning but deadbeat dad as well as street fighter for cash on the side just to get by. They meet at the beginning of the film when Alain kicks Stephanie out of the bar after she starts a fight; while it’s a strange connection, apparently it was enough for her to call him when she gets lonely in her insurance claim-purchased apartment. Can I get a oui oui for actually getting one of these diary posts on time? Now that I’m in a rhythm, hopefully you people following my every move in Cannes won’t have to wait like you did for the first three days – totally on edge, that is. There’s not too much to talk about today, but I’ll throw in a few pictures to make it interesting. I woke up early – 6:30, to be precise – in order to dash off quickly to get in the rush line for the day’s first screening of “Lawless,” John Hillcoat’s bootlegger drama starring Shia LaBeouf and Tom Hardy. Because I didn’t have a ticket, I had to arrive especially early if I wanted to get a chance at a seat not filled by a member of the press or someone with an actual invitation. I got to the front of the line at 7:00 A.M., a full 90 minutes before the screening was supposed to start. I snapped this picture of the red carpet with no one there; hopefully it gives you a sense of just how small it really is. I stood there for an hour and a half watching over two thousand people walk the steps up to the Lumiere theater, which really had me disheartened when the clock struck 8:30 and I had yet to enter. But around 8:33, someone came to declare (in French, which I don’t speak or understand) that they were simultaneously showing the movie in the Salle du Soixantième, a rooftop theater in the back of the Palais. Translation: in a few seconds, I quickly found myself at the BACK of the rush line of which I was originally at the front. So naturally, I sprinted. I probably pushed a few people. It was my exercise for the day. But in the end, I got to see “Lawless.” It was totally worth the effort. It was a very good, entertaining movie that probably won’t win the Palme D’Or or an Oscar, but it will hold up for many years on Sunday afternoon TNT viewings. I was then going to attempt to see the day-after screening of “Reality,” but the line was already absurdly long by the time I got out of “Lawless” around 11:00. I tried to see “Antiviral,” the first film of David Cronenberg’s son, Brandon, at 2:00 but left the line when I realized I had no chance of getting in. I tried again at 10:15 … still no luck. And then I ran to try to make Michel Gondry’s “The We and The I” at 10:30 around the corner only to barely miss the cut. I’m ready for another double feature day again! But it looks like tomorrow will just be “Amour” at 8:30 in the Lumiere (I at least have a ticket this time) and several panels of industry experts. Maybe I can make it to “Diamonds Are Forever” on the beach … but who knows, I may need to be up early on Monday for “Killing Them Softly.” (UPDATE: “Killing Them Softly” opens in competition on Tuesday … I need some sleep.) The American cavalcade begins next week!